Yesterday was a special day for me. Even if lots of things are not going too well recently. Yesterday was special. I received my copy of the latest book in ballistic publishing’s exposé series. The cool thing about it is that my painting. 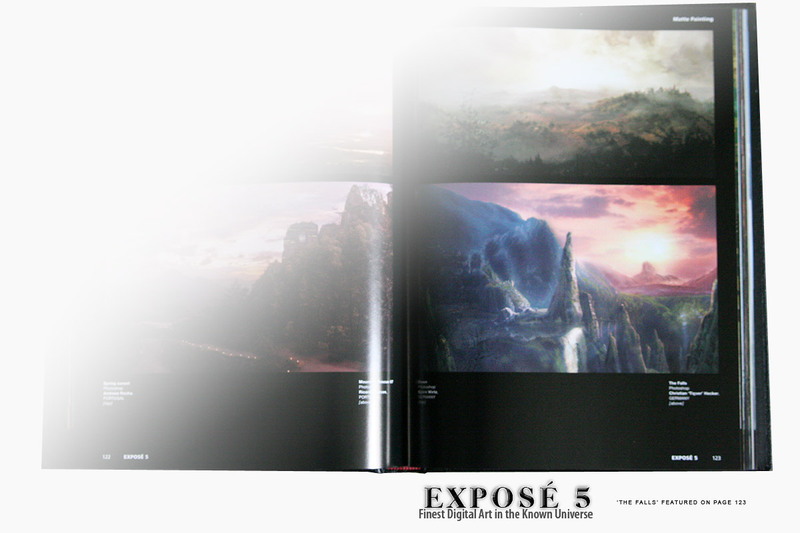 ‘the falls’, is featured in this book’s matte painting category. The sheer amount of talent in that book really blows me away and makes me really feel like an artist. There truly is no better book for digital art enthusiasts available out there. I got myself the leather limited edition. Just because the leather edition for artists, who made it in the book, is even more special than the leather edition available on their site. So there are only veeery few of them on this planet. The book came with certificate and everything… it looks delicious and i could fall in love with it. Seriously! I also recognized a lot of amazing work in the book that i earlier saw on communities like cgsociety or deviantart. Lots of fellow artists made it into the book and i want to congratulate them on this occasion. This entry was posted on Tuesday, July 3rd, 2007 at 16:24	and is filed under Publications. You can follow any responses to this entry through the RSS 2.0 feed. You can leave a response, or trackback from your own site. Mmmh… irgendwoher kenn ich das Bild.